We have to leave at 9:00 this morning so I will be quick. For breakfast I had bread and apricot jam, dates and a pancake-thing with honey that a woman had just made! We went for a short walk around the pool after breakfast and found out that the 6-year-old boy in our tour group is called Bond! We are leaving now so I will write later. We are on the coach to Meknes. Volubilis was amazing, but very hot. I took photos of all the mosaics, which were remarkably well preserved in terms of colour. 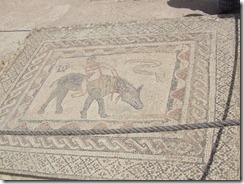 This is a mosaic of a man riding a donkey backwards, probably at a circus or fair. There was a basilica (law courts) which had been restored by the French colonists, and a forum which was just lots of pillars. 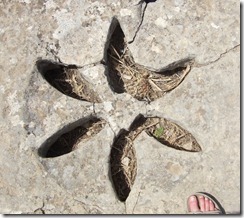 There was also a drain in the shape of a ‘morning glory’ flower, whose biological name is Volubilis! The Romans named the town after the flower. Anyway, it was fascinating. There are lots of jacaranda trees around; they have beautiful purple flowers. We are going to arrive at Meknes in about 25 minutes. I am writing from the hotel room. 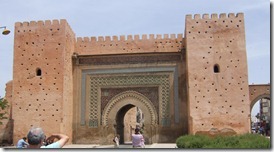 Meknes was very interesting. There was a gate called Bab Kh’miss which means Thursday gate. It is called this because there is a weekly souk on Thursdays there.Unfortunately, after that the camera stopped working! I think it is just the batteries that are going wrong. 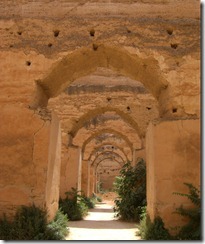 Then we went to the granaries of Moulay Ismail, who ruled in the 16th century. The granaries were very cool compared to outside, the thick walls and water running underneath would have helped to keep the grain fresh. Next to the granaries were the stables, which held 1,000 of the king’s 12,000 horses! They were absolutely vast. The town walls were amazing too. I think I will go swimming soon – Grandma is coming as well, but they have drained the main outdoor pool so we have to go in a pool that is sheltered on three sides and is much smaller. But it looks very nice so we will probably go sometime before dinner.